I have never seen such faces of awe and wonder on children’s faces in one day! 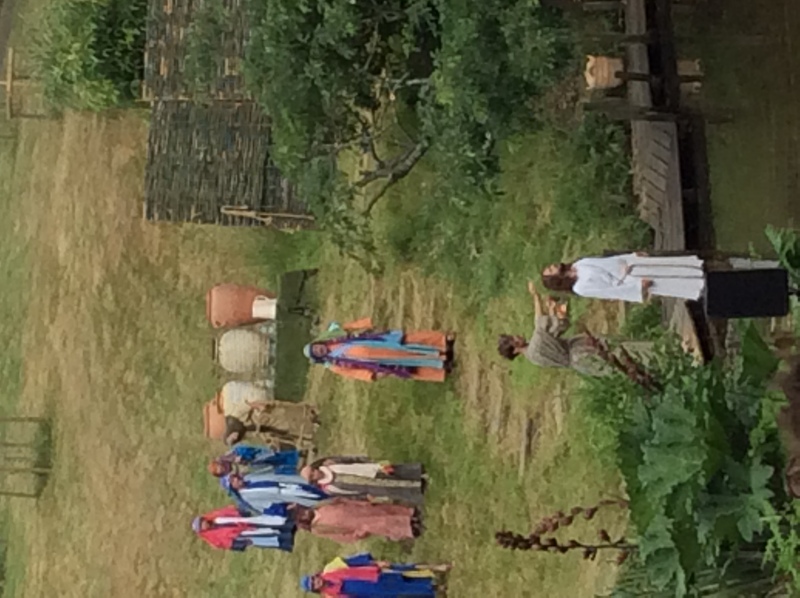 Year 6 were given the fantastic opportunity by the Parish of the Resurrection to visit Wintershall and witness ‘The Life of Christ’. The setting was stunning, the weather was beautiful and with a whole day to hear the story of Jesus, we knew that we were in for a treat. Luke, who wrote one of the Gospels in the Bible, set the scene for us and periodically narrated for us. We started in Nazareth where the angel visited Mary to tell her she was going to have a baby. A real life donkey helped Mary and Joseph on their way to Bethlehem. And the whispers of “it’s a real baby!” (who was 3 weeks old!) could be heard when Jesus was born. A bunch of shepherds with their real lambs came from the hillside to visit Jesus. The next scene was Jesus being presented at the temple to Simeon & Anna (the man who played Simeon was 92 years old and was the script writer of the play). The three wise men came to visit Jesus with their gifts of gold, frankincense and myrrh. 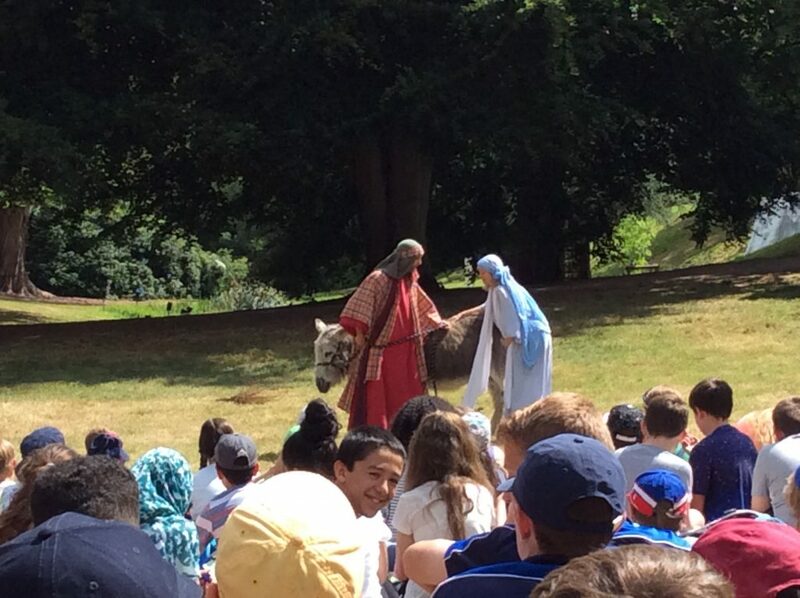 It wasn’t long before Mary and Joseph fled to Egypt with Jesus and a rather reluctant donkey! Herod’s decree of killing all the baby boys under two was startling as horses galloped over the hills towards us. Following that scene, we then saw Jesus in the temple and how frantically Mary and Joseph searched for Jesus when they thought they had lost him and in fact he was sat listening to the Priests in the temple. Mary and Joseph were not impressed! 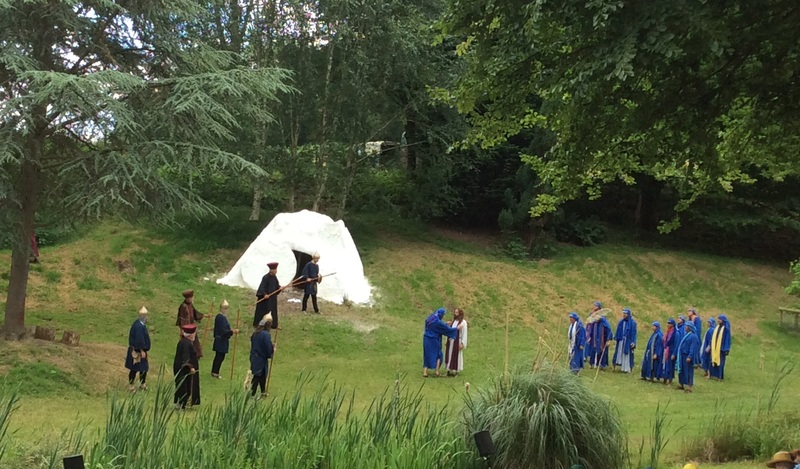 Act II had us moving to a completely different location near a hillside and a lake. Here we saw Jesus’ ministry played out: we saw John the Baptist baptising Jesus in the lake (an incredible moment when Jesus released a dove) talking to the woman at the well; being tempted in the desert; calling his disciples (which included a reluctant fisherman who he renamed Peter – meaning – the rock); turning water into wine a guest at a wedding; healing Jairus’ daughter. Perhaps one of the most memorable scenes was the feeding of the 5000 when Jesus and his disciples walked amongst us asking if anyone had any food they could spear. One of our children offered up their lunchbox “here, you can have mine”, he said. “I’ll come back for that one!” replied the disciple. We were then part of the miracle as Jesus shared out baskets of bread. As Jesus carried out his work and ministry in front of us, it was clear he was annoying the priests in the temple, who were looking for ways to get rid of him. At this point, we then had an interval to eat our own lunch before listening to a short but very interesting Q & A session with some of the cast, producer and director. We then witnessed Jesus visiting Mary and Martha and raising Lazarus from the dead. Soon after that, Jesus rode into Jerusalem on a donkey on Palm Sunday. He became really angry when he saw all the merchants using the temple to sell their wares, scattering tables, goods and doves in his wake. The mood visibly changed as we saw Judas being given 30 piece of silver to betray Jesus. He looked a broken man. We then witnessed Jesus washing his disciples’ feet and sharing in the Last Supper as Jesus told them what would happen. Jesus then went to the Garden of Gethsemane to pray with his disciples; you could have heard a pin drop as Judas betrayed Jesus with a kiss. Jesus’ trial was very moving as the children became part of the crowd shouting for Jesus to be crucified. The tension could be cut with a knife. We solemnly followed Jesus who carried his cross. There was compete silence as the enormity of what was happening became clear. We witnessed the Crucifixion – harrowing and yet there were soldiers that realised they had crucified the Son of God. 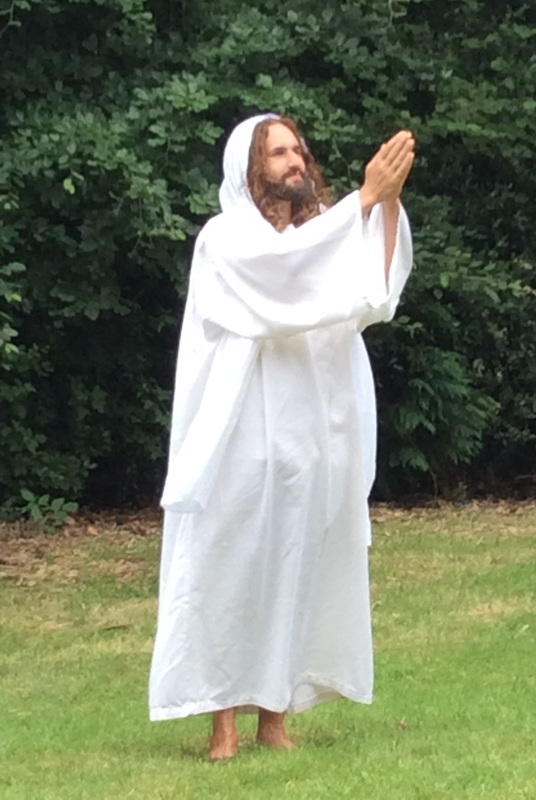 Seeing Jesus appear in the garden in a white shroud was quite an incredible and emotional feeling. 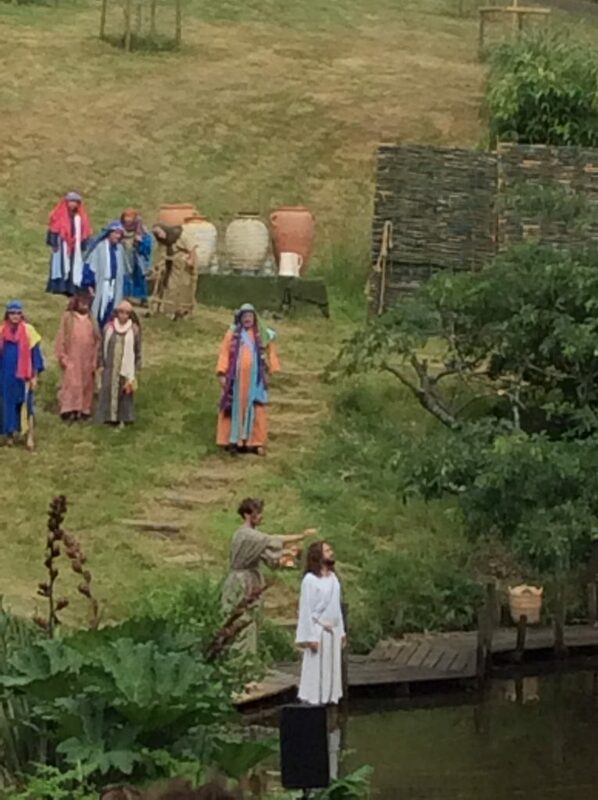 We saw Thomas doubting and then we moved to a lakeside for the last part of Act III. Here we joined the disciples cooking fish (real trout as tasted by the children afterwards!) and saw their reaction when they saw Jesus! Thomas who had been the reluctant, doubtful disciple became the exuberant, excited disciple diving out of the boat and into the lake to swim across to Jesus. We finished this incredible day by hearing Jesus talk to Peter about living a life of love, peace and most importantly, telling others about Jesus. Reading the quotes below demonstrates what an impact this trip to Wintershall had on our Year 6 children – something that will stay with them for a very long time.